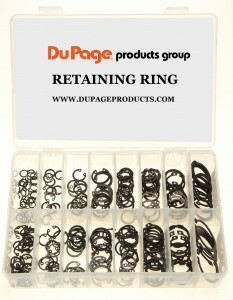 Similar to housing rings, these external rings accommodate components with large chamfers and radii. Handy kit for shop toolroom or toolbox. On hand when needed saves time and money. Plastic compartment box is easy to store. 30 each of 7/16", & 5/8"
25 each of 1/2", 9/16", & 3/4"
15 each of 1/4", 5/16", & 3/8"
10 each of 7/8" & 1"
Give us a call at 800-323-7208 or click the button on the right to use our contact form.